For this July 4th, I’m going to celebrate by taking a look at the horror film Uncle Sam, from the writer/director team behind the Maniac Cop trilogy. Desert Storm vet who was killed in combat rises from the grave on July Fourth, to kill the unpatriotic citizens of his hometown, after some teens burn an American flag over his burial site. The screenplay for Uncle Sam was, of course, written by Larry Cohen, the visionary horror writer/director behind The Stuff, Q: The Winged Serpent, It’s Alive, and God Told Me To. This was one of four of his screenplays that hit the screen in 1996, along with Mark L. Lester’s The Ex, Anthony Hickox’s Invasion of Privacy, and the television movie Ed McBain’s 87th Precinct: Ice. Uncle Sam was directed by William Lustig, who had previously collaborated with Larry Cohen on Maniac Cop, Maniac Cop 2, and Maniac Cop 3: The Badge of Silence. Lustig is best known for his gritty, b-level flicks like Maniac and Vigilante, which have built a significant cult following over the years. 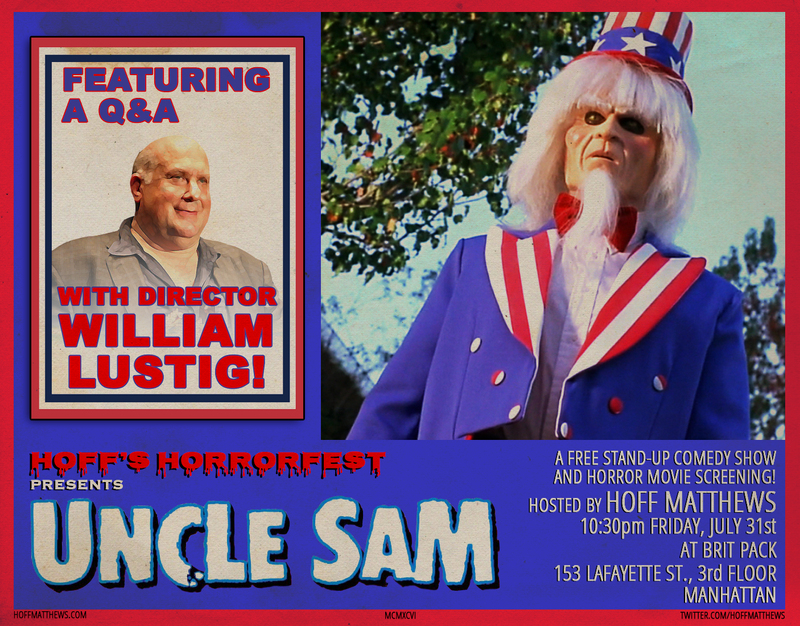 The cast of Uncle Sam includes the likes of William Smith (Maniac Cop, Any Which Way You Can, Hell Comes To Frogtown), David ‘Shark’ Fralick (Inferno, The Young and The Restless, Soultaker), Bo Hopkins (The Wild Bunch, From Dusk Till Dawn 2, Tentacles), Isaac Hayes (Escape From New York, South Park), Timothy Bottoms (Top Dog, The Last Picture Show, That’s My Bush), Robert Forster (Lucky Number Slevin, Jackie Brown, Avalanche, Alligator, Vigilante, Maniac Cop 3), and P.J. Soles (Halloween, Stripes, Carrie). The cinematographer for Uncle Sam was James A. Lebovitz, who shot a number of films for Troma Entertainment in the 1980s, including The Toxic Avenger, The Toxic Avenger Part II, The Toxic Avenger Part III, and Troma’s War. The editor for the film was Bob Murawski, who eventually won an Academy Award for cutting The Hurt Locker. His other credits include such titles as Gone With The Pope, Spider-Man, Spider-Man 2, Spider-Man 3, Drag Me To Hell, Army of Darkness, Hard Target, Night of the Scarecrow, and From Dusk Till Dawn 2. The musical score for Uncle Sam was provided by Mark Governor, who also composed music for Pet Sematary II and the Bruce Campbell flick Mindwarp. Reportedly, the production team for Uncle Sam failed to disclose to authorities that they would be firing a cannon late at night for the film’s finale, which led to a number of noise complaints from local citizens. Uncle Sam is dedicated to Lucio Fulci, an immensely influential Italian horror, western, and exploitation filmmaker who died just prior to the film’s release in 1996. 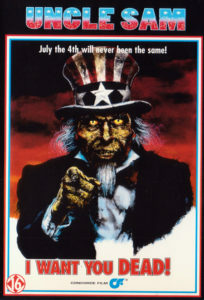 A blu-ray of Uncle Sam was released in June 2010 by Blue Underground, featuring commentary tracks by Larry Cohen, William Lustig, and Isaac Hayes, among others. Blue Underground, which was founded by Lustig, specializes in releasing cult, exploitation, and foreign horror movies on DVD and blu-ray. I loved the original idea — that he was this patriotic killer. I loved the concept. Then there was all of the makeup sessions. (I didn’t do the burn, but I did all the rest of the stunt work.) It was four and a half hours in makeup and four and a half hours out of it. It really just tore my skin up. What they do is they use alcohol on skin to get the oils off so that everything they needed to put on you would adhere. It was pretty amazing. In fact, I still have the last mask I wore in the film! From what I can gather, Uncle Sam did not receive a theatrical release domestically, and was distributed primarily on home video. I found an unsubstantiated budget estimate of $2 million, though that accuracy is certainly questionable. It is hard to say whether this flick ultimately turned a profit, but I imagine it probably broke even: I’m sure it was intentionally kept cheap for that very reason. Honestly, I think Rabin and Barton are both right about Uncle Sam. The satire and social commentary isn’t quite fully cooked: there’s just a kernel of an idea in regards to military worship and conditioning children to violence, but it isn’t much built upon. Likewise, it is a pretty run-of-the-mill horror flick, in the tradition of the various lesser holiday slashers. At the same time, if you go into the movie with low expectations, and just want a formulaic slasher with some fun effects and kills, this is exactly what you want. As far as the cast goes, it is always damn cool seeing Isaac Hayes pop up in movies. I absolutely loved him in Escape From New York, and I’m a little surprised he didn’t pop up in more over the years. This movie in particular could have used more of him: his relationship with Sam is only somewhat touched upon, and isn’t dug into too deeply. Another sequence or two with him maybe could have helped tie some themes together. Interestingly, one of his biggest emotional moments in the movie uses dialogue copied straight out of the Maniac Cop 2 screenplay: he tells a brief anecdote about being covered under dead bodies during war, remembering specifically how cold they were, and then recalls that the killer had a similar chill. Speaking of the Maniac Cop franchise, the makeup effects on Sam reminded me specifically of Maniac Cop 2 and Maniac Cop 3. There is a lot of emphasis on his mutilated hands in the first act, which was also specifically done with Cordell in the Maniac Cop movies. Likewise, the makeup effects have a distinctly burned and partially decomposed appearance, not unlike the more deteriorated and decomposed facial work from the later Maniac Cop flicks. When they are shown, the effects look pretty decent, though they are kept concealed under a mask most of the time. Notably, Lustig managed to use shadows and blocking to conceal Cordell’s face in Maniac Cop, and I think that made a big difference in how intimidating the character came off, particularly when compared to the masked Uncle Sam, who never seems nearly as imposing or frightening here. One of the biggest problems with Uncle Sam is the terrible lead child actor. Any time a movie has to lean on a child actor, it is a big risk: children who can act are rare, and ones who can carry a leading role are even rarer. In this case, a lot of the movie rides on the character of Jody, who is played by a very young Christopher Ogden. There are times where Ogden is totally serviceable, but they are few and far between. For the most part, his line deliveries are just off, and he puts in a physical performance like he’s robot. At the end of the film, there is supposed to be some ambiguity as to whether Jody is good or evil: this is supposed to be shown through a close up on his face, where his expression is intended to instill the audience with a sense of doubt. Unfortunately, Ogden just can’t do it: his eyes are expressionless, his mouth is unmoving, and his body language is neutral. If it weren’t for the music cue and a “shattering” effect to end the shot, I wouldn’t have realized that there was a potentially sinister undertone. Personally, I think one of the biggest problems with this movie is the screenplay: it is a bit too busy, particularly in regards to the characters. For instance, Uncle Sam has both a sister and a wife, who live together and serve almost identical purposes. Likewise, there are two child characters with “unique” connections to Uncle Sam: one is a random kid with a psychic link, and the other is his nephew, who he is trying to recruit. 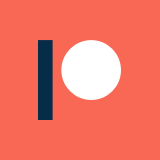 To me, it seemed like both the psychic link kid and the wife were completely unnecessary: their key traits could have been taken on by his sister and nephew, respectively. It actually would make more sense for Jody to have a psychic connection to Sam, and the coalescing of the wife and sister would play more into the incestuous themes that are mentioned in the story. Overall, as I previously mentioned, Uncle Sam has some value as a shallow, formulaic slasher movie. It was definitely a bit late to the game, though: this would have fit in great in the 1980s, but seems dated for the mid-1990s. It does provide a 4th of July themed horror movie, though, if that is what you are looking for. While this is definitely not one of Cohen’s better screenplays (nor one of Lustig’s better movies), there is definitely a kernel of an interesting idea here, even though nothing much comes of it.